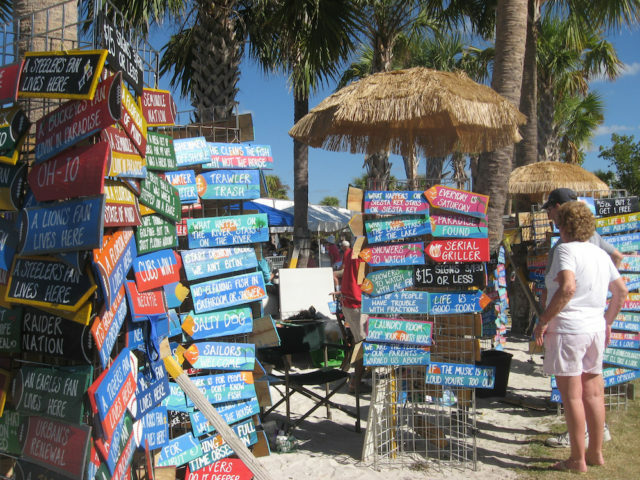 Everyone knows that if it is Saturday on Siesta Beach, something wonderful will be happening. Dec. 3 was no exception. 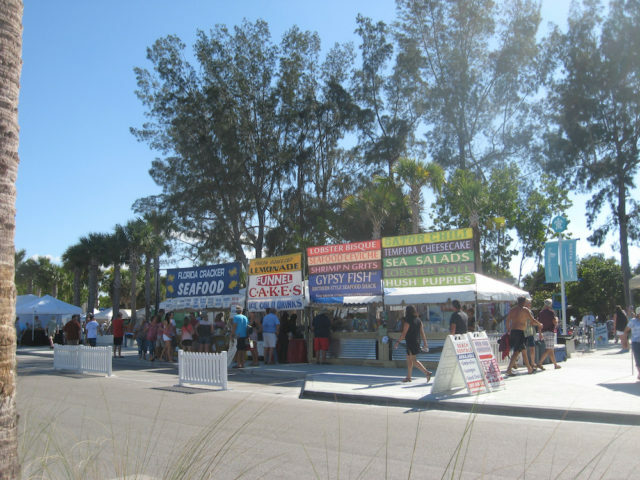 With a magnificent, cloud-free azure sky and that blazing sun shining down, Siesta Key Beach was hosting its first Seafood & Music Festival. Whoever came up with this concept of combining two sensory favorites is a genius (I met him later on). 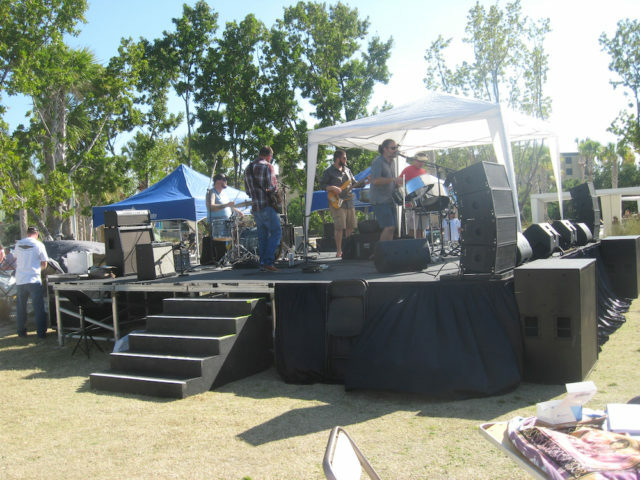 He also designed the layout of the food, drinks and booths and put the stage together to face the audience. I followed the tropical sounds of steel drums — which I could hear from my perch near the water’s edge — in search of the festival vendors and a band. As I walked toward the playground of the county’s beach park, I was happily assailed by the fragrant aroma of fish frying. This was my first clue that something outstanding indeed was happening, and I was very eager to experience it. I could not believe what I found: Thousands of people were there, patiently standing in various lines, waiting to be nourished. You first had to purchase tickets for food and drinks, which made sense, so the servers could move right along without having to be burdened with handling money. Long tables had been set up to encourage people to mingle as they ate and listened to the sounds. Can I just say that I have never seen such a happier group of people of this size? The security officers did not have too much to do except enjoy themselves with the rest of us. And, still, the crowds kept coming. And the music kept playing. It was hard to dance and eat at the same time, but I saw a few people try it. Nobody wanted to miss out on this spectacular day. I will have to find out exactly how the organizers planned the layout and set everything up so perfectly. The fact that admission was free certainly added to the pleasure. Gator, shrimp, crab: “I’ll have one of each, and make it snappy; I have a band to hear.” I had just been introduced to Bill Kinney, the organizer and creative genius in charge of this wonderful event. 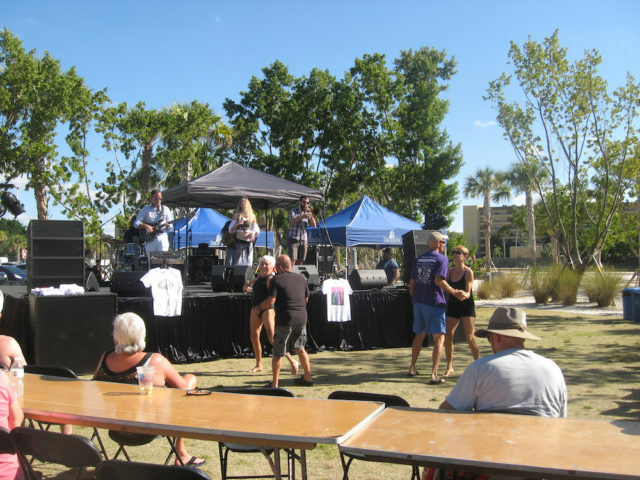 He comes from New York, is extremely friendly and — while I continued complimenting him on organizing the first (hopefully, annual) Siesta Beach Seafood & Music Festival — I got the idea that he was used to being praised. I decided next to check out the booths and consider what to buy. I noticed that just about all of the crafts had a nautical theme. I saw many people admiring a collection of beautiful carved wooden turtles that had been polished and lacquered. 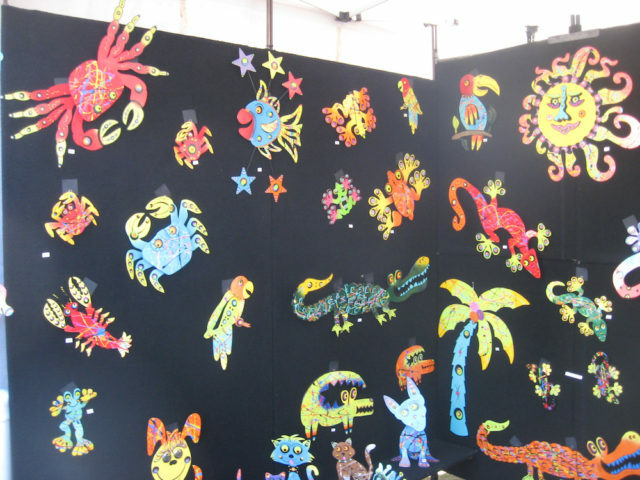 Beside that booth was a display of colorful metal carvings that looked just as enticing. I recognized many fish, but I liked the crab best. Further along, a man named Hunter Skipper was selling beautiful long-sleeve T-shirts with unique and colorful designs. The prices of everything seemed affordable; many people were buying mementos. I wondered how many of the visitors would return the next day, as this was a two-day event. I also thought about the potential for new guests to show up on Sunday. This had the makings of being fabulous. On Sunday, the perfect weather enticed me to return to the festival. I did not want to miss the opportunity to hear more musical melodies and enjoy more delicious seafood. My more convenient game plan that day was to leave my beach gear at home and just walk up to the event. When the music began, I learned the band was Ari and the Alibis, a local group I never had seen before — three musicians and a singer (Ari). They started with a stunning jazz rendition of Summertime that must have lasted 10 minutes. Were we really on Siesta Key and not in Greenwich Village? George Gershwin would have been impressed. As the sounds filtered outward, people began grabbing chairs and filling out the audience. Next this phenomenal group was playing and singing the soundtrack from Jesus Christ, Superstar. Sounded like Broadway to me — and the whole group was from Sarasota. Ari’s range, and the emotion she put into each song, reminded me of Janis Joplin. I kept trying to leave but the songs kept drawing me back. Ari sang one composition the band members wrote called Dirty Little Secret and then told us the group has been nominated for a Grammy. It was time then for a snack and a walk. The crowd seemed smaller that day. Maybe more of the visitors were on the beach, enjoying our perfect weather. Next thing I knew, I was looking at a gigantic paella pan — the biggest one I had seen in my life. The huge shrimp used in the dish that was cooking added to its excellent flavor. Even though seafood of every kind was featured, I did see a group offering beef only, which was a relief to all the carnivores. The steak tips with garlic were very tempting. By then, my camera batteries were dying and the band was taking a break. Time to wrap up my second jaunt to this event. Thank you, Bill Kinney. You are a genius.